Dr. Geoffrey Dobson lives in the Pas de Calais and writes on a number of science related topics. While millions worry about CO2 emissions, climate change and swine flu, few know anything about the potential threat from asteroid impact or of any international action to reduce the risk. Dr. Geoffrey Dobson fills in some of the details. 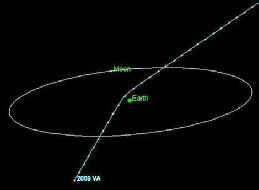 The track of asteroid 2009VA over just a 24 hour period. - a space rock the size of a suburban garage which passed well within the moon's orbit - so close, in fact, that the asteroid's orbital path was bent by Earth's gravitational pull. If it had hit, the ~6-meter wide space rock would have disintegrated in the atmosphere as a spectacular fireball, causing no significant damage to the ground. But the fact that there was so little warning is troubling. 2009 VA was discovered just 15 hours before closest approach by astronomers working at the Catalina Sky Survey. 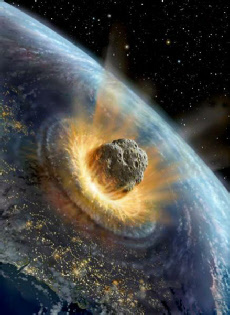 When, 65 million years ago, a 10km diameter asteroid collided with the earth, landing in the ocean just off Mexico’s Yucatan peninsula, it burnt a hole in the atmosphere during its descent and caused an explosion on impact equivalent to billions of Hiroshima atomic bombs. A shock wave from the impact threw trillions of tons of molten rock into space, tore the atmosphere apart, and caused massive hurricanes. The combined effects of shock wave and hurricanes tore the landscape apart. More shock waves drove through the core of the earth causing massive earthquakes and volcanic eruptions around the globe while others, travelling through the ocean, caused huge tsunamis that flattened anything left and flooded all the land around the Atlantic. Further tsunamis were triggered by the earthquakes. After the initial blast, molten rocks began to rain down over the surface of the planet extending the fire damage. A cloud of dust blocked out the sun for months, leading to a “nuclear winter” of freezing weather. Sulphur and nitrogen in the atmosphere were oxidised in the fireball causing prolonged acid rain. The explosion destroyed the ozone layer, leaving the Earth open, once the dust cleared and the nuclear winter ended, to a spring of deadly ultraviolet radiation. Dinosaurs, and most other life on earth, apart from simple organisms buried deep in the soil, were wiped out. Space is still filled with fragments of rock and dust left over from the creation of the solar system and much of this debris is concentrated in the “asteroid belt” between the orbits of Mars and Jupiter. Although most of the fragments are very small “micrometeorites” there is a lot of big stuff out there, and gravitational forces in the solar system can cause some of these asteroids end up on a collision course with the earth. But asteroids aren’t the only problem. The solar system also contains billions of comets. These are the remains of medium sized planets ripped apart by gravitational forces during the formation of the solar system. Most of this debris is well outside the solar system, but a few percent remains in an orbital zone which, though very distant, occasionally brings comets, at intervals ranging from tens to hundreds of years, within the inner regions of the solar system. A comet consists of an icy core surrounded by a cloud of smaller particles. As it approaches the sun, gases in the icy core evaporate and, “blown” away from the nucleus by the solar wind, form a glowing tail pointing away from the sun. At the same time, dust particles released from the surface of the nucleus create a wake of small meteorites. When Earth passes through one of these trails, we are treated to showers of shooting stars in night sky. The stream of shooting stars known as the “Perseids”, that we see each August, originate from the debris stream of the comet “Swift-Tuttle”. The most famous comets can appear as very bright objects in the night sky and in ancient times were regarded as harbingers of significant events on earth. Halley’s comet was first recorded by astronomers in 240BC and has appeared every 75-76 years since. Its arrival is sometimes interpreted as an omen of some momentous event. Some astronomers have linked its arrival in 12BC to the Star of Bethlehem story. In 1066 the English regarded the comet’s arrival as a bad omen for King Harold while the Normans thought it a good omen for Duke William. An image of the comet as a blazing star appears in the Bayeux tapestry. In 1997 the comet “Hale-Bopp” was clearly visible to the naked eye for months. It was hailed by some as a portent of alien invasion or global disaster. In China Deng Xiaoping died, New Labour under Tony Blair scored a landslide victory in the UK, and members of the “Heaven’s Gate” cult committed mass suicide in the USA. Fortunately Hale-Bopp will not re-appear in the inner solar system until 4530. In 1994, thanks to the Hubble telescope, the world watched on television as the Shoemaker-Levy comet hit Jupiter with the energy of a nuclear war. Although the comet was ripped apart by Jupiter’s gravity, one 4km diameter fragment caused an explosion in the planet’s atmosphere equivalent to eight billion Hiroshima bombs. Governments were so horrified that in 1996 they set up the “Spaceguard Foundation” with the aim of cataloguing potentially dangerous asteroids and comets orbiting the solar system. So far they have calculated that there are about 100 000 pieces of rock bigger than 10m diameter in the asteroid belt. A small percentage of these have orbits that pass dangerously close to the Earth. In1992 the comet Swift-Tuttle passed uncomfortably close. Some astronomers have predicted that next time round in 2126 it will get us. Even in recent history some very large lumps of space rock have hit Earth, sometimes with catastrophic results. In 1908 a small comet exploded in the atmosphere about 6km above Siberia. The explosion was equivalent to about 1000 Hiroshima bombs and destroyed 2000 sq km of the Siberian forest. If it had arrived a few hours later it would have destroyed St Petersburg. Similar size asteroids struck Brazil in 1931 and Greenland in 1997. In October 2009 a previously unknown 10m asteroid exploded high over Indonesia with the energy of a small atomic bomb. If asteroid impacts continue at their present rate into the future, we can expect a collision with a “city destroyer” every few decades. Fortunately, most asteroids of this size would explode high in the atmosphere causing no damage to the global surface, and, as oceans cover two thirds of the Earth’s surface, there is a reasonable chance that they would miss inhabited areas. They could, even so, cause devastating tsunamis. A “nation destroyer” might impact on us every 10 000 years, and a “global catastrophe” every 200 000 years. The “global extinction event” might happen every 50 million years. One pessimist calculated that your chance of being killed by an asteroid strike is about 750 times more likely than winning the lottery, so it might be a good idea to keep your head down.